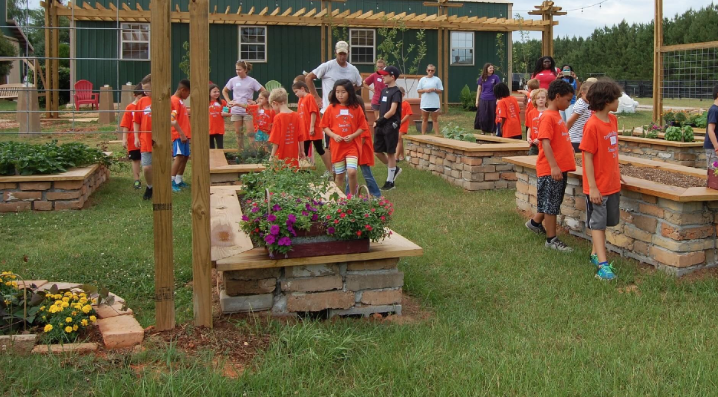 Just as reading a whimsical story transports us to alternative realities that are light and hopeful, Storybook Farm aims to do the same thing for the families, volunteers and most importantly children that come to the farm. Storybook Farm’s mission is to meet the needs of children in the local and surrounding areas through therapy with their 17 horses, 10 dogs, several cats, and “secret garden”. The farm uses all five senses from riding on horseback to digging your hands in the cold, wet dirt to help children escape everything from depression to developmental challenges. “The underlying mission of Storybook Farm is to be a breath of fresh air from the pressures that surround our lives,” founder Dena Little explained. Dena Little’s two passions growing up were always reading and riding horses. When she was not outside riding her horse Polk, she was pouring over her favorite series “Billy and Blaze” by C.W. Anderson. She held onto these passions throughout her adult life and was inspired one day after reading a newspaper article about a non-profit farm in New York that used equine therapy to serve children. In 2002 Dena finally worked up the nerve to sell her successful bakery in Atlanta and chase a dream that had been stirring in her heart since reading that article. With her two-year-old and four-year-old daughters in tow, she used the proceeds from selling her bakery to buy land and two horses in Opelika, Alabama. She had no inclination that almost two decades later she would own over 51 acres of land which serves 1,500 children with varying disabilities every year. Storybook Farm’s namesake was birthed from Dena’s English literature background in college. She has always appreciated the power of a story, and the fancifulness that is sparked in each of us as we are immersed in a character. Storybook Farm names all of their animals after character’s names in literature. This theme is one that carries on not only through the names of the animals but also through activities that the farm does to inspire creativity in the children. For example, the volunteers write the children stories from the animals in the context of their storybook character. Imagine receiving a letter from the horse named Dr. Watson detailing his adventures with his detective friend Sherlock Holmes. Not only do the children have bonds with the animals, but there is also a relationship fostered between them and the characters that the animals take on. This is just one way that the storybook theme is woven into the fabric of this special place. The Storybook theme goes into the names of the animals, but also the names of activities. Recently, more land was purchased for the farm to expand and have riding trails. On this new land, there will be a “Fox and the Hound” dog park for the kids to play in. There is also a “Secret Garden” where they weekly get to watch seeds grow and ultimately gather the fruits of their labor. “The possibilities with stories is endless. There are always more characters and inspiration, so it is the perfect theme for this place which has endless potential and opportunity for growth,” Dena said. Storybook Farm is kind of like your favorite book, one that you want to revisit over and over again, wishing that you could have just five more minutes with the characters that made you dream a little bigger, feel a little braver and hope more deeply. “All children are seen the same when they step on Storybook Farm’s property. We allow the therapeutic powers of animals coupled with being out in nature to nurture a sense of imagination and belonging at Storybook that fills an emotional gap in children’s lives that I believe we all have,” Dena said. Storybook Farm is completely funded by grants and donations. Their primary goal is to never have to ask the families that come to pay a dime. This is possible through three annual events that take place throughout the year. Storybook Farm’s claim to fame is that their Derby Day Auction is the largest Kentucky Derby watch party in the state of Alabama. Upwards of 800 people are expected to attend this year, and it always amazes the farm how enthusiastically the community gets behind this event and goes all in. This is Storybook Farm’s largest fundraising event of the year, and creates opportunities for expansion, ensuring that they never have to turn a family away from being served at the farm. Tickets and opportunities to sponsor this event can be found at https://hopeonhorseback.org/derby/. From women wearing hand-made hats decked out with accessories and trinkets, competing for the most spectacular hat award to men in full-blown seersucker suits for the Dapper Dan award, there are so many ways to get involved in this annually anticipated event. Attendants love competing during the auction for packages like a spa day in Atlanta to hunting trips in Argentina. The scent of the fresh pastures and authentic mint juleps made with the same recipe as the official Kentucky Derby’s creates an ambiance much like the official Kentucky Derby. There is an undeniable energy that comes from the community when they are rallying behind a common cause and pouring resources into something so pure. Storybook Farm brings out a child-like spirit in parents, volunteers and donors alike. “I think the standout thing of Storybook Farm is that there’s really no one that we turn away. Dena has created a place that loves everyone and she wants to help everyone that Storybook can. Many places like Storybook only take kids with cognitive disabilities or physical or only things that they know about. Storybook takes everyone, even if they don’t ride a horse for a while until they get used to them, we try to make a place for everyone.” Storybook Farm volunteer Audrey Fisher said. This place has left each visitor, volunteer and especially Dena with a little more direction and passion for their lives. But it has not been without adversity. Dena confesses that it can be overwhelming looking at some of the barriers that the families are having to overcome. However, the beautiful truth in this confession is that the meaningful things in life have a cost, but the benefits are more meaningful than can be expressed. Whether it is Auburn student volunteers realizing they want to pursue careers in helping kids with special needs, or families receiving a break from the grind of hospital visits and hard conversations.